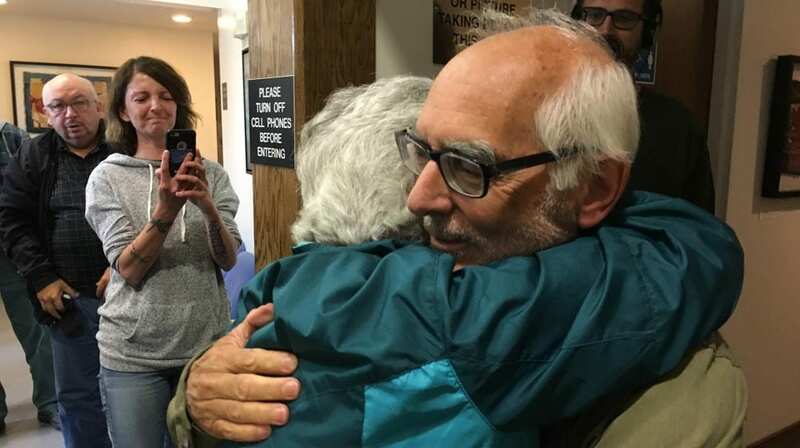 Cheers and applause greeted three Labrador Land protectors who were back in Happy Valley-Goose Bay Supreme Court Monday morning after spending the last 10 days in jail. Jim Learning, Eldred Davis and Marjorie Flowers were charged with contempt of court for breaching an injunction obtained by Nalcor Energy, a provincially-owned Crown corporation. 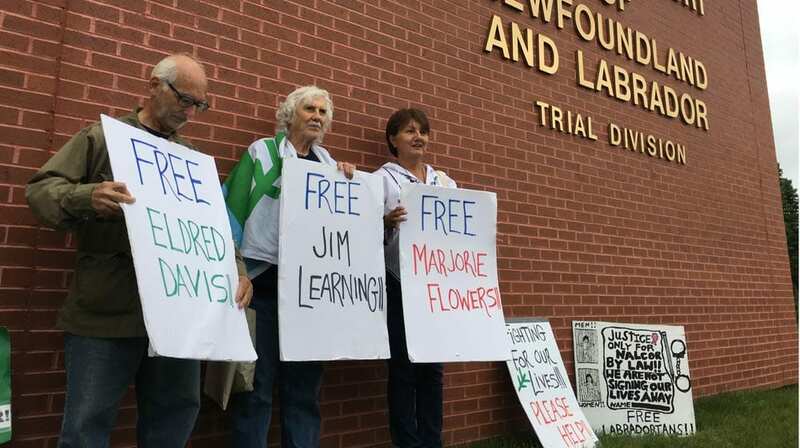 On July 21, all three refused to sign an undertaking to stay one kilometre from the Muskrat Falls hydroelectric dam and were taken into custody and sent to the St. John’s jail 1,500 km south. 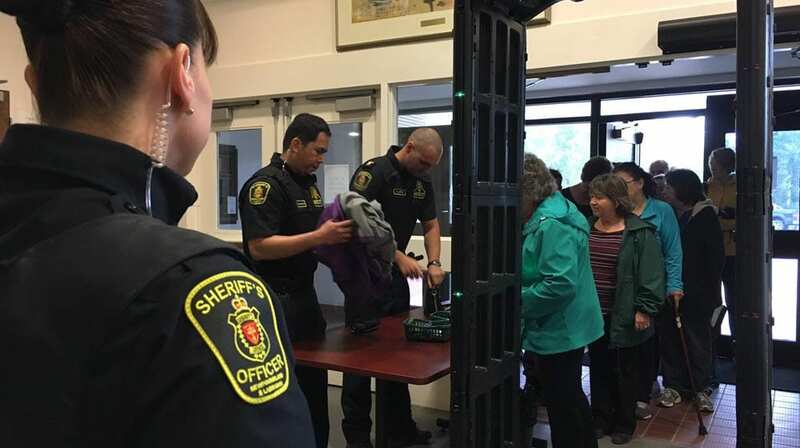 On Monday morning they were back in Happy Valley-Goose Bay and before Justice George Murphy who was appearing via video conference from Cornerbrook. The judge cautioned the people in court against disrupting the proceedings after emotional outburst July 21. When Davis came into court, he was met with a quiet show of solidarity as people raised their arms and waved. Davis has refused to eat while in jail. “My mind was tested to the limits,” Davis told the court on his time in jail. The judge told Davis he didn’t want to send him back to jail, but if Davis refused to comply with the court order, he had no choice. His next court date is set for the end of August. He agreed to sign the undertaking this time. The 79-year-old has fought the hydro project at Muskrat Falls for years. Nalcor alleges Learning trespassed on its property on June 25 and 26. Then blocked traffic entering the main gate at the Muskrat Falls site on July 18. Murphy said there’s a difference between protesting and breaking the law. He urged Learning to sign the undertaking, saying he didn’t want to send him back to jail. Flowers consulted with her St. John’s lawyer Mark Gruchy who asked the court for the option of house arrest in lieu of jail time. Murphy agreed. 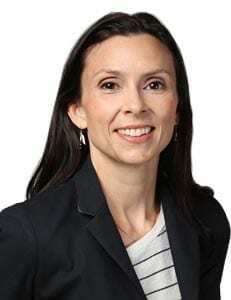 Flowers has to abide by an undertaking she previously signed in November 2016. The judge then offered the same option to Learning. The court took a short recess so Learning could consult with his partner Roberta Benefield and lawyer Mark Gruchy. Learning steadfastly refused to sign an undertaking but agreed to house arrest over going back to jail. When the three land protectors were released after the court proceedings, they were met with hugs and cheers. Learning and the others will appear in court again at the end of August. Fifty land protectors are facing civil charges. Thirty-seven people are also facing criminal charges related to protests at Muskrat Falls. The hydro project has been criticized for its impacts on the environment, skyrocketing costs now over-budget at $12-billion, and a lack of consultation.